Container candles are a great choice for the first-time candle maker. An age-old craft, candle making involves just a few simple steps, yet without the right materials and knowledge about the process, the resulting product can be disappointing. The wick could drown in the wax, the scent could rapidly disappear or the candle could become so hot that the container holding it breaks. “It really is a science,” said Melissa Eldridge, spokesperson for Natures Garden Candle Making & Soap Making Supplies based in Wellington, Ohio. For first-time candle makers, Natures Garden and other candle supply companies offer heaps of online information about materials and candle making processes. Here are some highlights, as well as some helpful resources for the aspiring candle maker. Thousands of years ago, early civilizations around the world began making wicked candles with materials that were readily available, according to the National Candle Association. The ancient Romans rolled papyrus and repeatedly dipped it in melted tallow or beeswax. The Japanese made candles of wax extracted from tree nuts. And in India, early candle wax was created by boiling fruit of a cinnamon tree. Over the centuries, the materials used in making candles has evolved as waxes and wicks with more desirable qualities have been discovered. In the 18th century, the wax obtained from sperm whale oil became a popular ingredient because it was harder than tallow of beeswax, produced a brighter light and — believe it or not — did not emit a bad odor when burned. And in the 1850s, chemists separated wax from petroleum and refined it to create paraffin wax, which is still popular for candle making today. Modern day candle makers use a wide variety of waxes and wax blends. Every type of wax has properties that may make it more or less desirable to a candlemaker. For example, beeswax — the byproduct of making bees making honey — has a beautiful golden color, emits a subtle sweet scent and is hard when solid, making it ideal for making pillar and taper candles, as well as candles shaped or textured by moulds. However, the natural aroma of beeswax often masks or alters any added fragrances. On the other hand, soy wax, which has increased in popularity in recent years, is fairly soft and therefore best suited for container candles. This wax is generally better at throwing aroma than beeswax, but it’s not as well as paraffin wax. 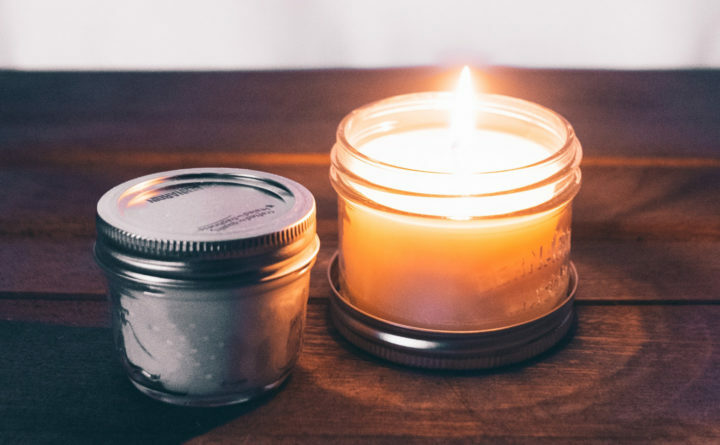 Paraffin wax is known for being one of the best for throwing scents, but some modern-day candle makers shy away from using it because it “may possess some carcinogenic properties,” according to the U.S. Department of Labor Occupational Safety and Health Administration. And, although it is not considered to be toxic by the U.S. Centers for Disease Control and Prevention, paraffin wax fumes can cause irritation to eyes, skin and the respiratory system. Other popular waxes include coconut wax and palm wax, Binder said. And waxes can be blended together using recipes or through careful experimentation. Candles can come in all shapes and sizes, but some of the easiest to make are container candles, which are simply candles that are created by pouring hot wax into a glass jar or another type of container that can withstand heat. “Pretty much anything you’d feel comfortable pouring boiling water in is good for holding a candle,” said Cindy Novack, founder of Candles & Supplies, based in Pennsylvania. To create a container candle, you simply heat up your chosen wax (usually in a pot over a stove) to about 180 degree Fahrenheit. For this step, you’ll need a thermometer. Then, while the wax is liquid, you can add dyes and scents. There’s some debate about what can be used as scent in a candle. Some use a combination of essential oils, while others will only use fragrances made specifically for candle making, which are sold by candle making supply companies. If using a fragrance made for candle making, Novack suggests adding it to the wax when its at its hottest so it will blend well. However, if using essential oils, you may need to wait for the wax to cool a bit so the oils don’t break down or vaporize. Different essential oils vaporize and even catch fire at different temperatures; this is called their “flash point,” and for many oils, this number is below 180 degrees Fahrenheit. The flash point for oils varies somewhat by source and batch; therefore, some oil suppliers offer charts of flash points to their customers to help them with their selections. To color a candle, there are dyes created specifically to dye wax; however, different types of wax will display these dyes differently. For example, soy wax tends to soften colors into pastels. With the scent (and perhaps color) added, the wax is then poured into the container, where a wick is placed in the center, usually suspended from a pencil or another object that can span across the rim of the container. When talking with first-time candle makers, Binder always stresses the importance of selecting the right wick. To help customers select the right wick, Candlewic.com provides charts that narrow down wick options based on candle size and wax type. They also offer over-the-phone advice, as do many other candle supply companies. A flame that’s too large can produce smoke and soot. It can also make the candle too hot, and in some cases, this can cause the container to break. On the other end of the spectrum, if a wick is too thin, it won’t become hot enough to melt through the entire candle (but will instead create an unsightly pit at the center of the candle), which wastes much of the wax. It can also cause the flame to drown long before the wick is burned out. Once you’ve selected your candle making materials, it’s important to follow each step of the process. Many candle making supply companies provide written and video tutorials on how to create certain types of candles. Another common mistake that beginner candle makers make is adding components to candles that can catch fire, such as dried flower petals and perfume. One common candle making DIY involves coloring candles with crayons, Novack said, and she doesn’t suggest it. While there may seem to be a lot to candle making, once you’ve gotten a handle on the materials, the process is easy, Novack said. And if you love burning candles, making your own may save you money in the long run. It’s also an opportunity to be creative.